This article focuses on the elements of the Water Framework Directive referring to transboundary water courses and analyses the current need for their improvement throughout Europe in order to mitigate the effects of flooding. Flooding is a natural phenomenon that mostly affects the entire river basin. It only takes on catastrophic dimensions and becomes a security risk, when human lives or properties are endangered. The floods of August 2002 left thousands homeless and caused severe property damage across Europe amounting to several billion euros. Under the impression of this event, the EU initiated a new strategy to tackle the issue of flooding. One of the basic principles of this strategy calls for taking into account the entire catchment area when addressing flooding risks. In order to mitigate such effects a viable approach would be to set up joint river management bodies, such as the international river basin commissions, where they do not yet exist. These joint bodies should be requested to more explicitly incorporate flood prevention and protection into their activities and be entrusted with the development of good management practices for flood prevention and protecting across national borders. Cooperation on transboundary waters must be seen as a chance for creating a system of effective interdependence. The Bellagio Magazine including the entire article is available for download [pdf, 997 KB, English]. Ecologic is a member of the Bellagio Forum for Sustainable Development. Dworak, Thomas and Eduard Interwies 2004: “Linking Transboundary River Management to Water Security: the Example of Flooding in Europe”. The Forum. 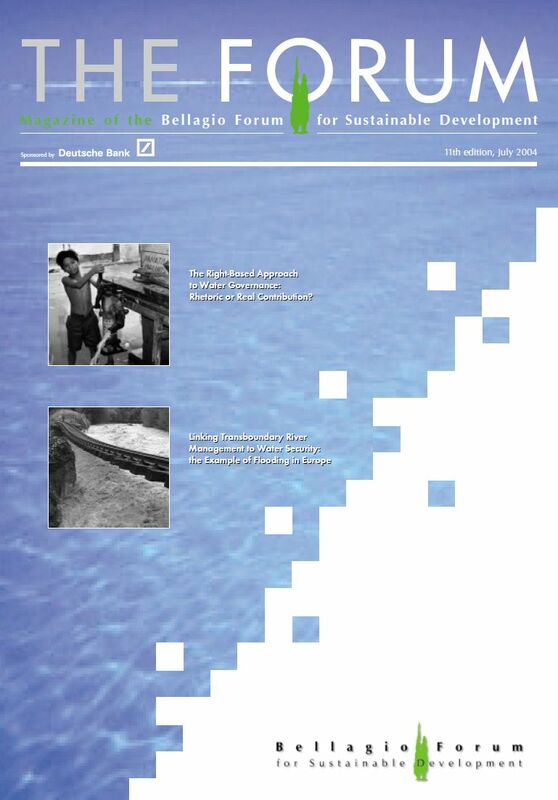 Magazine of the Bellagio Forum of Sustainable Development, Vol. 11, No. June, 12-14.